In the Loire Valley, or the “Garden of France”, there is an ancient grape variety that goes by a number of names, including Grolleau (rhymes with Merlot, though is anything but). 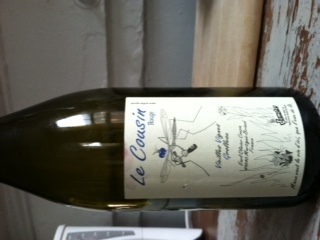 Olivier Cousin has created an interesting wine from this little known and nearly extinct grape. The wine is produced biodynamically in fertile, loamy, limestone soils, and given an extended maceration time. The wine itself is quite unusual. In my personal experience, it changed shapes and sizes each of the 5 days I had it open. Dark black and red berries, scattered tannin, a bit of chalkiness. A gem from Talitha and Meguire at Vine Wine in Williamsburg. So groovy.